With minimal storytelling, characterization or interaction, little direction and even less feedback, TARTARUS will only appeal to a small subset of players who would appreciate a DOS-like command line experience in their first-person sci-fi adventures. It’s the year 2230 and something has gone wrong aboard the MRS Tartarus, a mining spaceship traveling through the stars. As everyone else is either dead or indisposed, it’s up to Cooper, a blue collar miner and the ship’s cook, to access the antiquated computer system to fix numerous problems plaguing the vessel. Most of this is done through command line interfaces reminiscent of DOS. 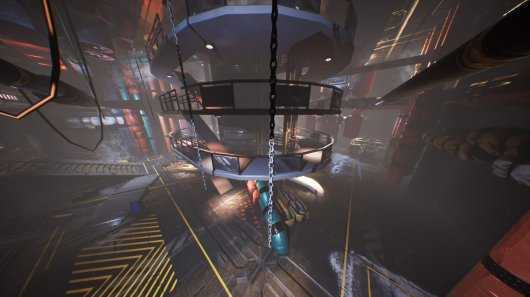 As such, Abyss Gameworks’ first-person 3D exploration adventure TARTARUS is targeted at a very narrow segment of the gaming population. If you’re outside of that limited demographic you will be frustrated. If you’re inside it, you’ll still be frustrated but at least you’ll have a sense of accomplishment as you overcome each programming-based challenge. As the story opens, Cooper awakens in the ship’s galley, having lost consciousness when an accident caused the craft’s systems to fail. During the crisis, Cooper managed to stab himself in the leg with his own kitchen knife, although this is quickly forgotten as you begin exploring, climbing ladders and crawling through air ducts. In short order, Cooper gets in touch with a man named Andrews over the comms. Andrews is the ship’s engineer, but he’s trapped elsewhere and is unable to deal with the current complications. Andrews explains that the Tartarus is suffering various system failures and that it’s up to you, as Cooper, to deal with them. The first opportunity to do so comes upon reaching the bridge. Here you will find Andrews’ access card which you can use to access his computer. Picking it up adds it to a limited inventory you carry only for reference rather than for solving puzzles via item combination. Upon taking the card, a series of prompts appear detailing how to display the inventory and view the item in a 3D close-up. At the same time, Andrews and Cooper discuss the next steps to take. I made the mistake of reading the onscreen prompts instead of listening to the conversation. As a result, I missed what Andrews had to say about his user ID and password, and there was no way to replay the information. TARTARUS utilizes a checkpoint-based system, so I had to restore the most recent save to listen to the conversation between Andrews and Cooper again. Fortunately in this instance I wasn’t set too far back, but there were other sections of the game where I had to quit between checkpoints, losing all recent progress as the game neither autosaves upon quitting nor gives you the option to perform one manually. At any rate, once I got back to where I started, I made sure to listen to Andrews and Cooper and then had no trouble logging in. The computer systems present a command line interface (CLI) similar to what you would see in DOS, Unix, or Linux command prompt sessions. That’s a fancy way of saying that you’re dealing with ye olde fashioned green text on black background (although you can change the font color, if you prefer). Here you type in various commands such as “list” to show the files in the current folder, or “sf” to change to a different folder. The antiquity of the computers isn’t limited to the command line display either, as none of the computers on the Tartarus are networked together. The fact that each computer you use has its own set of files and folders to search through would seem tailor-made to afford players the opportunity to snoop through different crew members’ emails and/or other documents. However, only those files and commands that are relevant to the current puzzle can actually be used and you never learn any personal details about your colleagues through your computer interactions. The terminals do list more files than just the ones you need, but anything that’s not important to what you’re currently doing has been corrupted and is inaccessible. While the command line process is based on similar real world interfaces, it is not an exact reproduction. People familiar with real CLIs will still find themselves stopping to remember the different names the game assigns to standard commands, such as “sf” for selecting a folder instead of “cd” for changing directory. It’s a little thing but it tripped me up on more than one occasion. The commands on offer here are also much more limited than their authentic counterparts. While this is understandable – it is just a game and not a full-fledged operating system after all – it does make some interactions for experienced users more awkward and tedious than they should be. For those who haven’t had experience with CLIs before, this will likely prove to be a barrier or at least impose a very high learning curve. When you log onto Andrews’ computer for the first time, he remotely walks you through the first couple of commands, literally spelling out the “sf” command for you before an explosion happens and he’s cut off. You’re then left to figure everything else out for yourself, which remains the case for all of the other computers through the rest of the game, even once you reestablish contact with Andrews. While the computers do provide you with all the information you need to operate them, people unfamiliar with CLIs will be hard pressed to recognize the pertinent information among all the unnecessary distracting data presented. As a programmer, I’ve been using such systems since the old DOS days and there were a couple of times even I struggled due to vague in-game documentation. This problem is compounded by the lack of feedback typically given to you. If you get something wrong, you’ll basically be told you got it wrong without any additional direction. It’s up to you to sort out what you did incorrectly yourself and fix it. In the CLI portions of the game, you’ll encounter a number of different types of challenges. Most start by searching through all the files in the current folder hierarchy and viewing as many of them as possible. The files that you can open will give you the information you need, in bits and pieces, to solve the main puzzle at hand, which consists of using a specialized view to perform a specific action. For example, when you reach the bridge, the door locks shut behind you due to a piston failure. You then have to run a special program unique to Andrews’ computer that allows you to key in the appropriate pressure values needed to repair the pistons. You’ll need to work out which pressure values to use from the other information found on his computer. Other obstacles involve opening and closing specific air hatches in the cargo bay, pinging and connecting to remote computer terminals to send a distress signal (in Morse code, no less), and solving sets of relatively complex math equations to stabilize the ship’s reactor. There are several math-based challenges of enough complexity that you’ll want a calculator on hand to help you through them. Just be sure to remember your BEDMAS order of mathematical operations. It also wouldn’t hurt to be passingly familiar with basic electrical knowledge – at least enough to recognize watts, volts, and amps and have a general understanding that they’re related to one another. It’s within these CLI puzzles that the bulk of your interactions in TARTARUS occur. Some of them are actually quite clever and although they can be frustrating, they do give a sense of accomplishment when you finally solve them. Only occasionally are there other tasks, such as gathering items or manipulating valves, which you’ll do around the ship in person. You move through the 3D environments in typical first-person fashion with the mouse and keyboard. 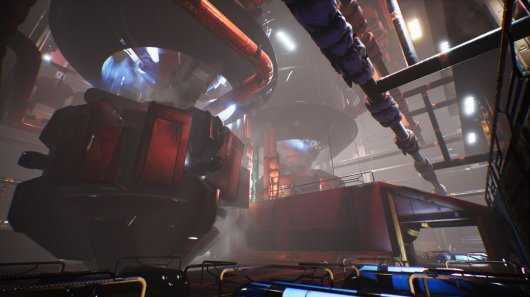 The game is powered by Unreal Engine 4 so it should be capable of some quite impressive sights, and it does seem like the developers have put a fair amount of detail into the environment. However, they also chose to shroud most areas of the ship in darkness, requiring you to use the narrow beam of a flashlight to hunt down the few interactive points of interest. Here again, only those areas that are relevant to a puzzle are active. There’s no opportunity to snoop through lockers or search crew quarters for personal insights into life in outer space. The game consists solely of Andrews telling you the next system that needs to be repaired, you navigating your way to that part of the ship, and then fixing the problem. This extreme streamlining makes for a very empty experience for those looking for a story or character interactions. During my seven-hour exploration of the Tartarus, it didn’t really feel like a spaceship to me. Rooms are arranged almost at random and don’t seem to conform to the profile of the ship as shown in the opening cinematic, and the computers aren’t the only ancient things aboard. Shelves and tables are littered with 3.5” floppy disks, VHS tapes, and audio cassettes. And with no windows to show that you’re in space, save for the windshield on the bridge, the whole setting made me feel like I was in some underground bunker in the late 1970s or early ‘80s as opposed to a spacecraft in the 23rd century. Even more oddly out of place is the amount of takeout food you discover. Boxes for pizza and chicken wings – and the food itself – is scattered throughout many parts of the ship. Combined with all the (non-interactive) vending machines, it did make me wonder how good a cook Cooper actually was. While much of the experience feels cramped, there is one sequence where you get to venture outside along the hull of the ship. It’s a short trip but easily my favourite part of the game. It was nice to get out of the dark confines of the Tartarus and float through space with asteroids tumbling nearby. This section is conducted in zero gravity though, so it may be especially disorienting to people who suffer motion sickness from first-person, free-roaming games. Back inside the ship, movement is about what you’d expect. You are able to hurry through some of the larger areas; however, either due to being out of shape or having been stabbed in the leg, Cooper tires quickly and returns to a walking speed after only a few seconds of exertion, limiting the use of the run option. One thing that is much more useful is the ability to step from high ledges and not die. There are a few spots in the game where this can speed up your progress versus climbing down a ladder or making your away around a series of ramps. TARTARUS is light on audio. It does have basic footsteps and other interaction sounds like typing on computer keys, but otherwise it’s a mostly quiet journey. Occasionally short musical riffs play when you reach an important location or perform a key action, though the music isn’t really memorable. On the voice front you only ever hear Cooper and Andrews as they talk to one another over the comms, or just Cooper when he mutters to himself. Both characters are voiced by the same actor, although he does a good job of sounding like two separate people. While the performances are decent, the dialog is less so. This is one of those games that seems to believe that in order to be “mature and edgy” it’s necessary to have excessive use of profanity. Cooper in particular is a fan of the F-bomb, dropping at least one in almost every sentence. Some people may not care. Some people may find the language offensive. For myself, I always find this approach unintentionally comical. Less funny for me was the game’s performance. To be fair, my graphics card wasn’t quite up to the recommended level although it far exceeded the minimum requirements. Most of the game played silky smooth with all settings at max. However, late in the game I reached the maintenance bay and ship’s reactor, a large cavernous space with lots of curved pipes. There my framerate dropped into the low single digits, with the game frequently pausing altogether for several seconds. It became nearly unplayable and remained so for most of the rest of the game. Changing all graphics options to their lowest settings didn’t help. Restarting the game didn’t help. Restarting the computer didn’t help. TARTARUS always slowed down at exactly the same point every time I tried. Still I mustered on and slowly pushed through the final couple of sections towards the end. When I reached the last scenario, I thought I might have to concede defeat. The final stretch is a mandatory stealth sequence where failure results in death. With such poor technical performance I barely got two feet before getting killed. Oddly, after reloading the game at that point the display went back to normal and ran smoothly once more. That still didn’t help with the stealth sequence, unfortunately. I must have attempted it almost two dozen times in an hour and only once did I manage to get even close to passing it. To put this in perspective, I’m a fan of first-person sneaker games like the original Thief trilogy and have never encountered a stealth sequence nearly as difficult as the one here. After my many attempts, I felt I’d given TARTARUS enough of my time. I quit out and fired up a YouTube video of the game’s closing moments, which seemed rather anticlimactic after the troubles I’d just experienced. I certainly didn’t feel like I’d missed out on anything by not completing it myself. I do believe that all games have an audience, I really do. Sadly, this was not a game for me as I found the CLI challenges to be quite tedious. Between that, the difficult stealth sequence, the relatively high system requirements, and the lack of any engaging story or characters to round out the experience, I expect it won’t be a game for most adventurers. However, if you enjoy solving things for yourself with no feedback, have a little bit of DOS-style command line experience and a passable amount of electrical knowledge, and remember your BEDMAS math operations, then you may just be in TARTARUS’s very particular targeted group of players. Even then, be sure to bring a calculator with you, just in case. Copyright © 2014 - 2019 SocksCap64, All Rights Reserved. Logos, Trademarks, Pictures Belongs To Their Respected Owners. Powered By WordPress. 92 Queries in 0.468 seconds.